Geosynthetics are available in a wide variety of configurations. They can be used alone or together to reinforce and stabilize poor subgrades. Due to their strength, resistance to elongation, and structure, they are capable of restraining the lateral movement of the base materials they come into contact with. They also can function as a separation layer to prevent the intermixing of subgrade soils or aggregate base. Using geosynthetics in construction increases performance and extends the service life of a structure, saving money in the long run. However, with so many choices, selecting the proper geosynthetic for your application can be challenging. Please contact our sales office at 609-971-8810. We welcome the opportunity to discuss your project and help you select the most cost-effective product for your next project. Geosynthetics are available in a wide variety of configurations. They can be used alone or together to reinforce and stabilize poor subgrades. Due to their strength, resistance to elongation, and structure, they are capable of restraining the lateral movement of the base materials they come into contact with. They also can function as a separation layer to prevent the intermixing of subgrade soils or aggregate base. Using geosynthetics in construction increases performance and extend the service life of a structure, saving money in the long run. However, with so many choices, selecting the proper geosynthetic for your application can be challenging. Please contact our sales office at 609-971-8810. We welcome the opportunity to discuss your project and help you select the most cost effective product for your next project. Constructing heavy duty haul roads, airport runways and railways is a challenge when dealing with a less than ideal sub-base. 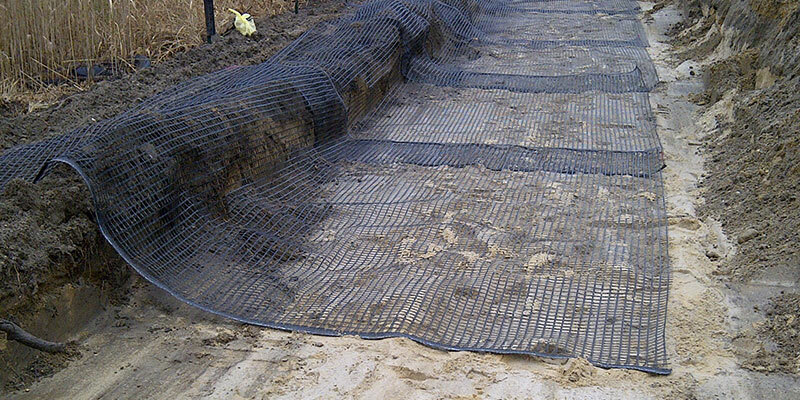 Geosynthetics such as high performance woven geotextiles and geogrids can provide the necessary reinforcement and separation elements needed to construct in low lying areas where soft wet soils can’t support the load. Using a geosynthetic layer in between the existing sub-base material and the fill prevents the subgrade from mixing or pumping up into the top layer. Geotextiles and geogrids can work together or alone to stabilize and reinforce weak sub-bases. This increases the amount of buildable land for development. Envirogrid geocells stabilize the soil by confining the base materials. This in turn prevents lateral movement and reduces pressure. Gabion baskets and reno mattresses can be used to line an outflow area or as a retaining wall. Geosynthetics are integral components in the construction of Mechanically Stabilized Earth (MSE) structures such as retaining walls, steepened slopes, and embankments. Placing geocells, geogrids, and/or geotextiles in layers during construction provides tensile resistance, enhanced stability and reinforcement of a steepened slope. In addition, wrapping the facing of the slope with geotextile/wire basket or geocell and vegetating enhances the aesthetics. Temporary and permanent retaining walls can be constructed economically with segmental concrete blocks as the facing and geogrids as reinforcement. The use of geocells or gabions can create a vegetated retaining wall that is both efficient and aesthetically pleasing. Constructing embankments on soft soil foundations by placing a geogrid and/or high strength geotextile at the base provides stability while limiting differential settlement. The use of geosynthetics can reinforce earthen dams, highway embankments, landfills, dikes, levees and to repair landslides. IWT Cargo-Guard supplied multiple geosynthetics for the widening of Interchange 48-63 on the Garden State Parkway in New Jersey, one of the busiest roads in the nation. The sensitive wetland area between mileposts 47.7 and 51.3 required slope soil stabilization along the shoulder as well as roadway subgrade soil stabilization. After working closely with the contractor Midlantic Construction, the NJTA, and the engineering department of Maccaferri Inc., it was determined that geogrid reinforcement was the solution. Due to the unique site conditions, a reinforced-soil structure (RSS) wall was considered the best option for the slope soil stabilization. To accomplish this, MacGrid WG5, a uniaxial polyester grid from Maccaferri Inc., was selected because of its excellent long term design strength and durability. IWT Cargo-Guard supplied multiple geosynthetics for the widening of Interchange 48-63 on the Garden State Parkway in New Jersey, one of the busiest roads in the nation. The sensitive wetland area between mileposts 47.7 and 51.3 required slope stabilization along the shoulder as well as roadway subgrade stabilization. After working closely with the contractor Midlantic Construction, the NJTA, and the engineering department of Maccaferri Inc., it was determined that geogrid reinforcement was the solution. Due to the unique site conditions, a reinforced-soil structure (RSS) wall was considered the best option for the slope stabilization. To accomplish this, MacGrid WG5, a uniaxial polyester grid from Maccaferri Inc., was selected because of its excellent long term design strength and durability. For the roadway soil stabilization, a biaxial geogrid was needed to redistribute loads and prevent localized shear failures. 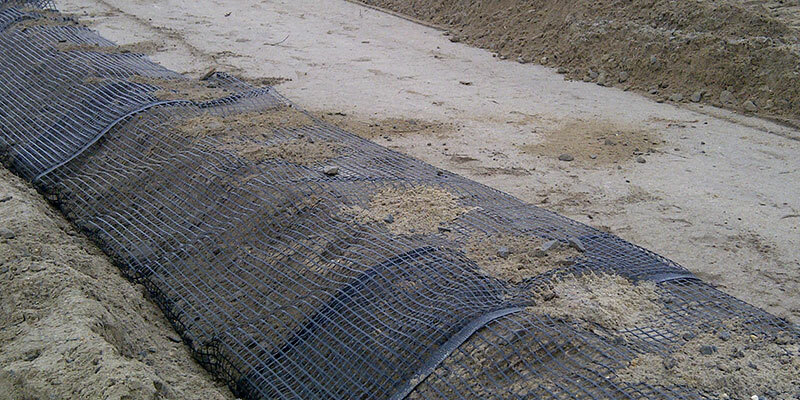 The Maccaferri MacGrid EG12 polypropylene geogrid was perfect for this application. The combination of these two geogrids was an environmentally friendly approach to this project. It allowed for extremely decreased land disturbance, reduction of aggregate needed, and the reuse of site soil. This reduced both construction time and costs associated to all parties involved. For the roadway stabilization, a biaxial geogrid was needed to redistribute loads and prevent localized shear failures. The Maccaferri MacGrid EG12 polypropylene geogrid was perfect for this application.